In the beginning there was water everywhere; nothing else was to be seen. There was something floating on the water, and on this raft were Old Man and all the animals. Old Man wished to make land, and he told the beaver to dive down to the bottom of the water and to try to bring up a little mud. The beaver dived and was under water for a long time, but he could not reach the bottom. Then the loon tried, and after him the otter, but the water was too deep for them. At last the muskrat was sent down, and he was gone for a long time; so long that they thought he must be drowned, but at last he came up and floated almost dead on the water, and when they pulled him up on the raft and looked at his paws, they found a little mud in them. When Old Man had dried this mud, he scattered it over the water and land was formed. This is the story told by the Blackfoot. 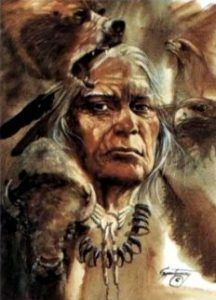 It is very much like one told by some Eastern Indians, who are related to the Blackfoot. After the land had been made, Old Man traveled about on it, making things and fixing up the earth so as to suit him. First, he marked out places where he wished the rivers to run, sometimes making them run smoothly, and again, in some places, putting falls on them. 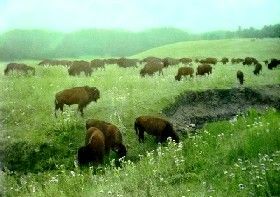 He made the mountains and the prairie, the timber and the small trees and bushes, and sometimes he carried along with him a lot of rocks, from which he built some of the mountains–as the Sweet Grass Hills–which stand out on the prairie by themselves. Old Man caused grass to grow on the plains, so that the animals might have something to feed on. He marked off certain pieces of land, where he caused different kinds of roots and berries to grow–a place for camas; and one for wild carrots; one for wild turnips, sweet root and bitter root; one for service berries, bullberries, cherries, plums, and rosebuds. At last, one day, Old Man decided that he would make a woman and a child, and he modelled some clay in human shape, and after he had made these shapes and put them on the ground, he said to the clay, “You shall be people.” He spread his robe over the clay figures and went away. The next morning he went back to the place and lifted up the robe, and saw that the clay shapes had changed a little. When he looked at them the next morning, they had changed still more; and when on the fourth day he went to the place and took off the covering, he said to the images, “Stand up and walk,” and they did so. They walked down to the river with him who had made them, and he told them his name. Old Man said, “I have not thought of that. We must decide it. I will take this buffalo chip and throw it in the river. If it floats, people will become alive again four days after they have died; they will die for four days only. But if it sinks, there will be an end to them.” He threw the chip into the river, and it floated. The woman turned and picked up a stone and said, “No, I will throw this stone in the river. If it floats, we shall live always; if it sinks, people must die, so that their friends who are left alive may always remember them.” The woman threw the stone in the water, and it sank. These first people did not have hands like a person; they had hands like a bear with long claws. They were poor and naked and did not know how to get a living. Old Man showed them the roots and the berries, and showed them how to gather these, and told them how at certain times of the year they should peel the bark off some trees and eat it; that the little animals that live in the ground–rats, squirrels, skunks, and beavers–were good to eat. He also taught them something about the roots that were good for medicine to cure sickness.